© Manish Gosalia Photopgraphy. 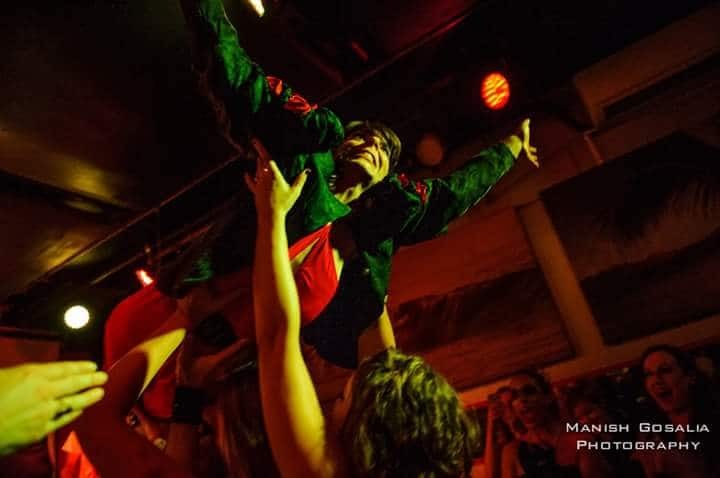 Abby Payne crowd surfing during single release show for “Vampire Song” at Pianos. “I’m going to town today to buy me a reputation,” the lean and lovely indie-rocker and Greenpoint resident Abby Payne lilts in the opening of the song “The Gunfighter Meets His Match.” She wrote that unapologetic line in 2011 when she was struggling with the idea of retaining a publicist to promote her name. © Manish Gosalia Photography. 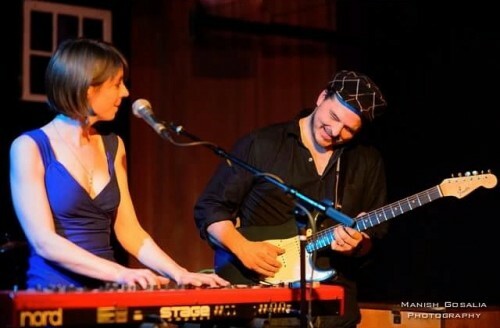 Abby Payne and Pete Francis playing during “You More” release show at the Living Room. Payne’s fourth album, also entitled The Gunfighter Meets His Match, was released on May 26 through her website. 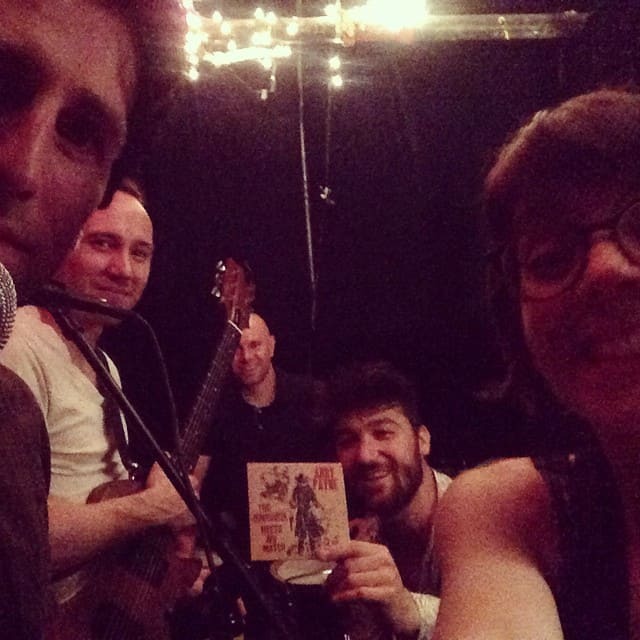 The release show happens on Thursday, May 28 at 9 pm at the Living Room (134 Metropolitan Avenue, Brooklyn). Courtesy of Abby Payne. Practicing for the release show while drinking tea from one of her favorite mugs. The mug was given to her by friend and dancer Chelsea Retzloff. “I would have all these ideas and I couldn’t afford to make them happen,” says Payne of how she felt in 2011. She directed that frustration into her songwriting. 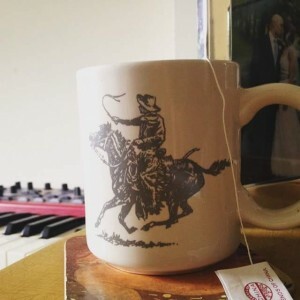 The Gunfighter Meets His Match proved to be a rewarding motif: “I think I just realized it was a good device for expressing what I was going through and having a character wouldn’t make it so obvious and boring.” She is currently adapting the Gunfighter story for a musical production. The first look at the musical production of The Gunfighter Meets His Match took place at Gershwin Live at Dixon Place in February. Payne wrote the script and music, Beth Callen wrote an additional song, and Glitter Kitty Productions choreographed and managed staging and direction. Annie Now and Emily Vetsch of Glitter Kitty Productions, veterans of musical dance theater and puppetry production, are Payne’s longtime collaborators. They originally suggested the adaptation after hearing the song, “Like a Devil,” performed live. This affecting slow rock ballad closes out the just released album. The full musical, which will run 70 minutes, will premiere at the Dorothy B. Williams Theater in SoHo as a part of HERE Arts Summer Sublet Series on August 25 and 26. © Manish Gosalia Photography. 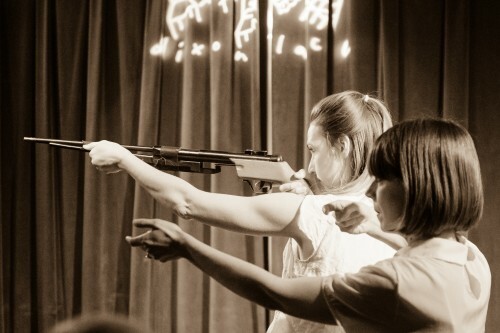 Abby Payne and Emily Vetsch in a scene from The Gunfighter Meets His Match musical first look at Dixon Place. Courtesy of Abby Payne. At a rehearsal for the release show. Besides the gunfighter motif songs, there are six additional songs on the new album. The release show will feature Payne (vocals, piano) and album contributors, Wil Farr (vocals, guitar), who also produced much of the album, JP Schlegelmich (accordion), Chris Anderson (bass, background vocals), Payne’s husband, Kenny Shaw (drums, percussion), and Kenny Warren (trumpet). Follow Abby Payne on Facebook, Instagram, and Twitter.